Zhang Yimou’s masterpiece Raise the Red Lantern opens with a young woman preparing to make a fateful decision. In 1920 China, Songlian (Gong Li), a 19-year-old university student, is forced to abandon her studies after her father’s death left the family destitute. With few options available, Songlian tearfully tells her mother that she’s decided to marry a wealthy man. When her mother advises her that as the wife of a rich man she will be little more than a concubine, Songlian stoically replies, “Let me be a concubine. Isn’t that the fate of a woman?” It’s a powerful scene staged with stunning simplicity; Songlian is shown in close-up addressing her mother, who remains off-camera. At end of her speech, tears slowly roll down her cheeks belying sadness and resignation to her fate. Songlian becomes the fourth wife (or, as she’s referred to throughout the film, the Fourth Mistress) of Master Chen (Ma Jingwu). He lives on a vast estate with three other Mistresses and a cadre of servants. Each Mistress has her own apartment in the compound; however, like birds in a gilded cage, their life of luxury comes at a steep price: their freedom. At first, Songlian is treated well by the Mistresses and the servants. The first night in the estate, her apartment is festooned with red lanterns, she receives an elaborate foot massage, and Master Chen comes to visit. She soon learns, however, that this treatment is the exception rather than the rule. On a daily basis, the master decides which Mistress he will spend the night with, and the Mistress he selects will choose the menu for the evening, receive the red lanterns and the foot massage, and garner the most attention and respect from the servants. This ritual has fostered an environment of fierce competition, as the Mistresses vie daily for Master Chen’s affections. As Songlian adjusts to life as Master Chen’s Fourth Mistress, she gets to know the other women on the estate: Yuru (Jin Shuyuan), the First Mistress and the mother of Chen’s son; Zhuoyan (Cao Cuifen), the Second Mistress, described as having the face of the Buddha but the heart of a scorpion; and Meishan (He Saifei), the Third Mistress, a former opera singer. There is also Yan’er (Kong Lin), a longtime servant who dreams of becoming a Mistress herself. Songlian is savvy enough to understand the peculiar dynamics of the Chen household and implements a few schemes of her own to curry the Master’s favor. 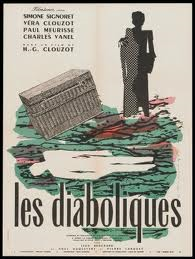 Despite her initial success, she soon finds herself double-crossed by one of the Mistresses. 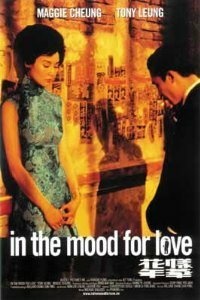 When Songlian eventually discovers that another Mistress is involved in an illicit affair, she unwittingly sets into motion a series of events that threaten the fragile structure of the Chen household. Raise the Red Lantern is a visually stunning film that uses color and cinematography to great effect. The color red is a central motif that connects the key visuals. 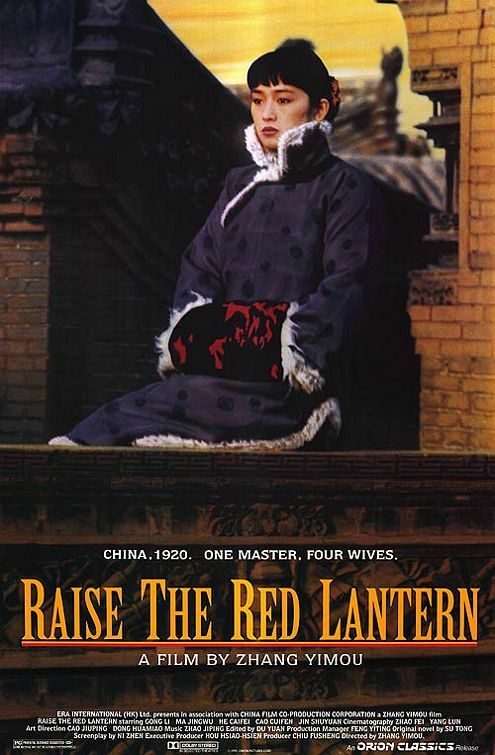 The red of the lanterns is reflected in the reds of the cheongsams worn by Songlian and the other mistresses. The impressive architecture of Master Chen’s estate is complemented by Yimou’s use of overhead shots. The setting’s beauty stands in stark contrast to the grim fates that await the mistresses. Gong Li, whose films with Yimou include To Live and Shanghai Triad, delivers one of her finest performances as Songlian. Raise the Red Lantern was nominated for an Academy Award for Best Foreign Language Film, and, in 2001, Yimou developed a ballet based on the film. In recent years, Yimou has directed a number of popular films, including Hero and House of Flying Daggers. Fans of Yimou’s later films may want to check out Raise the Red Lantern, one of the best films of the 1990s. Raise the Red Lantern is in Mandarin with English subtitles.